With the additions of Robinson Canó and Jed Lowrie during the offseason and the return of Amed Rosario and Todd Frazier, the Mets' infield is spoken for at all four positions. 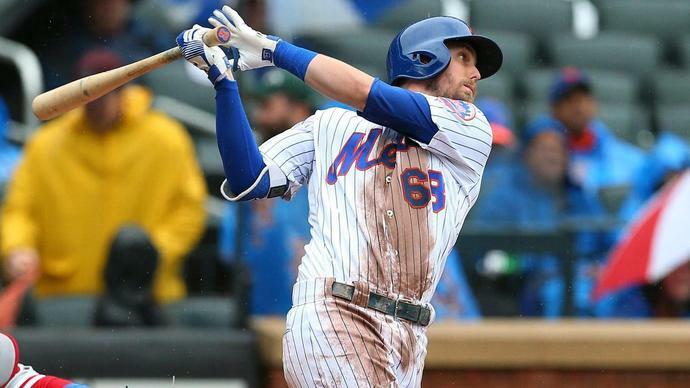 That leaves Jeff McNeil, who played 54 of his 58 games at second base last season, on the outside looking in. Per Matt Ehalt of The Record, Mets GM Brodie Van Wagenen said in an interview on WFAN about McNeil, "His focus in spring training is going to be a transition to the outfield because we think we can be a lethal lineup with a McNeil, [Michael] Conforto, [Brandon] Nimmo outfield against right-handed pitching." McNeil, 26, last played the outfield regularly in college. He said, "It's been a while since I've played games, but just about every day in the minor leagues I was taking fly balls. For the most part, I feel really comfortable and I felt really comfortable there when I played in college. That was a while ago, but I had some games out there last year. I played really well out there, so I'm not too worried." Last season, McNeil hit a highly productive .329/.381/.471 in 248 plate appearances. Albeit in a small sample size, McNeil didn't show much of a platoon split in 2018, posting an .866 OPS against right-handers and .812 against lefties. It sounds like the Mets are hoping to get him work in left field initially since it's the easiest of the three outfield positions to learn. Things aren't looking good for the Mets' ace.